How do you buy the best sofa? You go through all those nice resources available online and find the one matching your need. That sounds very easy. But there is one step where you might fail. Yeah, you guessed it right. Measuring a sofa is a tedious task. But don’t worry! We have here a good guide on how to measure a sofa. With this, you can easily measure your sofa’s dimension and do whatever you want. This will be very helpful when you’re planning to buy a slipcover or when you move the sofa from one place to another. Accuracy is everything when it comes to measuring a sofa or couch. Make it a point to note down the measurements in either inches or centimeters. Don’t confuse yourself by using both the measurements. Stick to one unit. Sofa covers come in a wide range of fabrics. Even polyester and spandex. Some may shrink on use. Some of them are stretchable and comes with ties for the best adjustment. So opt for the ones which stretch if you want more comfort for a larger cushion and sofa arms. Seek out another person’s help while measuring you couch for slipcovers. It is always better than a single person struggling with a tape measure and a long sofa. When you are ready to purchase a slipcover for your sofa, making it sure to measure everything first is very much required. How to measure a sofa can be a troubling question. If you don’t know it and start taking a measurement, the chances are that you’re going to mess it up. But let me tell you that measuring a couch is not a hard job. We have listed below the essential measures to be taken before buying a sofa slipcover. 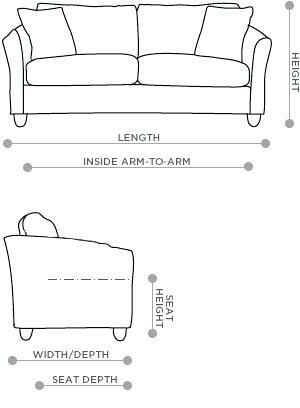 So here is the sofa measurement guide you need! The first measure you should take is from left arm to the right arm. Measurement must be taken from the outside of one arm to the outside of the other arm. This is the largest length of the sofa cover. Note it down on a piece of paper. Next thing we want to measure is the height of the arm. You should start by measuring the front first, applying the tape measure down and measuring up. The next measurement you want to take is the width of the sofa starting from the front to the back. The last measurement you have to take of your sofa would be the height of the cushion. Applying the tape measure down to the floor into the top of the cushion. Check out the frontal area below the arms of the couch. This is where you measure the cushion width. Start taking the measurement from one side to the other. Make it a point to note down the widest point as it ensures best fit for the sofa cushion. Having all your measurement of the sofa will help you shop for the sofa slipcovers next time. The one way to get the correct measurement of your sofa is from the manufacturer itself. But even the best sofa brands might fail in giving the exact dimension. I hope the guide has helped you in finding the correct measurement of your couch to get a nice slipcover.